Every two years at the Natural Stone Show in ExCeL London the construction industry is reminded just what a vital part natural stone plays in creating the great architecture of the UK. There is not an area of construction that dimensional stone does not play a part. And what is meant by dimensional stone is big lumps of stone taken from mines and quarries and skillfully worked as opposed to aggregate or concrete. Granite worktops, marble wall linings, marble, travertine and limestone floors, granite setts and kerbs, sandstone paving, limestone, sandstone and marble cladding on commecrial building, even traditonal architectural masonry such as the superb Portland limestone structure at Holborn Viaduct, London, where exhibitors Portland Stone Firms supplied the masonry. In the day-to-day bustle of business it can be easy to forget just what a diversity of stone is available for every conceivable project from the patio and walling on modest domestic developments to prestigious city centre offices and apartments, hotels, urban regeneration, even the slates on roofs. There is hardly an area of construction where natural dimensional stone is not used. And if you have ever wondered how the blocks of stone extracted from quarries and mines are turned into the products of choice of so much of the construction industry, that was answered at the Natural Stone Show, too. The hefty machinery that saws great blocks of stone into regular workable shapes and these days also profiles and carves it into finished products was also there, along with the adhesives, grouts, finishes and handling equipment necessary to install and finish the stone for its whole range of uses from decorative interiors to structural exteriors. The Natural Stone Show is not the largest event ExCeL sees because the stone industry in the UK is fairly niche. But its traditions stretch back millennia beyond the pyramids and those within the sector have a common language that unites them, whichever part of the world they might happen to come from. And stone suppliers certainly do come from all over the world. Most of the stone used for interiors and hard landscaping these days is imported. The stone in black granite worktops usually originates in China, India or Africa. The huge variety of marble, travertine, limestone and slate floor tiles now available in the UK can come from all over the world. More exotic stones such as onyx, popular now as back-lit bar tops and fronts and feature walls, might come from the Middle East, South America, Canada or elsewhere. Cladding often comes from British quarries and mines – and there were plenty of the major UK suppliers showing their stones at this exhibition, of course – but also from imported stones, such a Jura from Germany and the variety of limestones offered by France, perhaps the best known of which is Caen or Anstrude. And the sedimentary stones will often be sitting on a plinth of protective granite from China, India, Portugal, Italy, Brazil or any of the other myriad sources available. 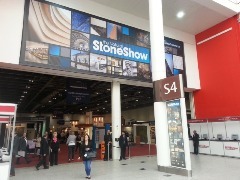 The stone industry in the UK has been enjoying the improvement in the construction industry in general of late and is on an up, which was certainly evident at this exhibition with a distinct feel-good factor shining through. But regulars to the show, which was celebrating its 20th anniversary this year, say there is always good karma at this biennial gathering of the petracognoscenti that ranges from architects who design in stone, through the mine and quarry operators and the stonemasonry firms who transform it into products, to the contractors who fix it – all specialists who form an elite among the professionals and trades of the construction industry. As the intensive three-day international convocation came to a close on Thursday afternoon there seemed to be universal agreement among the exhibitors that they had enjoyed a great show. Deals had been done and stories of success abounded. The machinery companies exhibiting said the visiting stonemasons had arrived with their chequebooks open. As Nicola Waters, Managing Director of Waters Group, a leading supplier of stoneworking machinery in the UK, told us: "It's been very busy – a really good show for us." Stone Equipment International Managing Director Andy Bell said: "We've sold a MarmoMeccanica edge polisher every day and have an awful lot of very, very positive leads to follow up when we get back to the office. Some people have even paid deposits on our Emmedue saws, so we know they're serious." Simon Manley on the Intermac stand, where a Master 30 CNC workcentre was displayed, said he had been approached by companies he was not familiar with; Stella Zambelis of D Zambelis said she had added to the tally of 14 Terzago saws she has already sold since taking on the agency less than 18 months ago as well as having a lot of interest in the smaller Achilli saws she sells. One Irish company, Joint It, that introduced its labour saving paving jointing compound at the 2013 show was back because, said Director Gary Duffy, after last time sales of his product had increased 600% – so much that he had been left with no option but to employ a representative in the UK to cope with all the enquiries. The person recruited was John Irving who was on the stand this time taking more orders. He told us: "We took orders for three tonnes yesterday and have sold 300 tubs of Joint-It at the show. We've had orders from other parts of Europe and enquiries from South Africa, Kenya and Vietnam here." The stone suppliers were also enthusiastic about the prospects they were looking forward to following up after the exhibition. 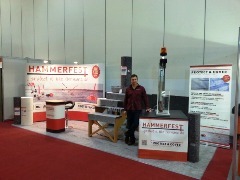 Colin Keevil, owner of England's Doulting Stone Quarry in Somerset, said: "It's been a very good Show. It's one of the best ways there is of meeting people who specify and use stone. When they come here to the Natural Stone Show they understand because they are interested." When we asked Hege Lundh of Norwegian granite company Lundhs, exhibiting for the first time, if she had enjoyed a successful Show she replied emphatically: "Oh yes!" Nigel Dunnett from another first timer, Agglotech, showing Italian Terrazzo, said: "I haven't counted, but I've had 80 to 90 leads. I'm assuming half of them will not amount to anything but eight or nine of them seem to be really interesting. It's been a very good show. I'm really pleased with the way it's all gone." Bath Stone supplier Bath Stone Group is a regular at the Stone Shows. Matthew Hawker: "I forgot how quickly the days go by. We have genuinely been so busy I didn't have a chance to go to the lectures I wanted to attend." The lectures he is talking about are at the Natural Stone & Building Conservation Conference that is run in the conference rooms on the floor above the exhibition during the three days of the event. The three days are themed: Architect & Designer Day; Industry Day; Conservation Day. The Architect Day is a RIBA CPD-accredited event that had as its theme this time the advantages of adding value with stone. The Industry Day is run by Stone Federation Great Britain, who also had, as usual, their stone 'village' at the heart of the exhibition; and the Conservation Day was overseen by the new Historic England organisation that took over the championing of the heritage sector role from English Heritage at the beginning of April.